Finally a black movie that’s not being released during income tax season. 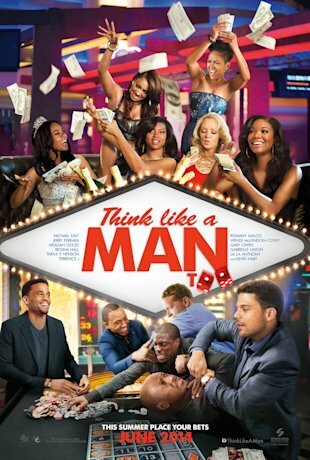 Sony Pictures just released the movie trailer to Think Like A Man Too, the sequel to the hit movie, Think Like a Man. Based on the best-selling black woman how to keep a man workbook by Steve Harvey, Think Like a Man Too is set in Las Vegas where one of the couples are getting married(cliche’ plot much?). Starring the same blactors and blactresses that seem to get cast in majority of African-American romantic comedies: Gabrielle Union, Kevin Hart, Michael Ealy, Regina Hall, etc., Think Like a Man Too is scheduled to be released this June. Check out the trailer and share your thoughts below. This entry was posted in Entertainment and tagged african-american movies, gabrielle union, kevin hart, las vegas, michael ealy, regina hall, sony pictures, steve harvey, think like a man by JimmieValentino. Bookmark the permalink.